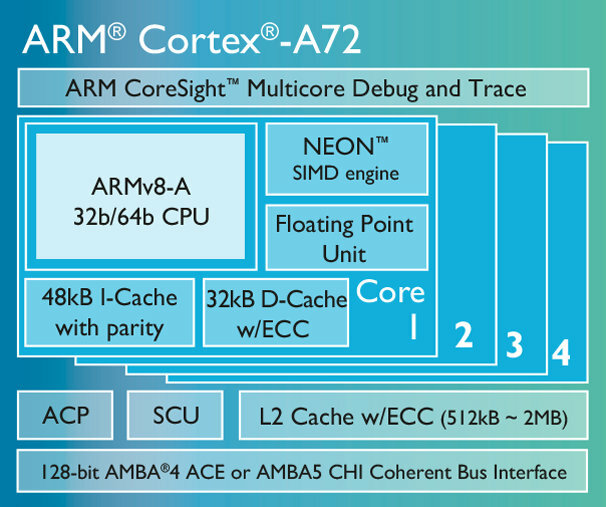 ARM has just announced their new Cortex A72 ARMv8 core with 3.5 times the performance of Cortex A15 ARMv7 cores, together with Mali-T880 GPU delivering 1.8 times the performance of Mali-T760, and CoreLink CCI-500 Cache Coherent Interconnect to link the new CPU, GPU and I/Os together. A cluster can support up to 4 Cortex A72 cores clocked up to 2.5 GHz in mobile devices and higher frequencies for larger form factor devices such as servers. Cortex A72 cores may also be combined with low power Cortex A53 cores in big.LITTLE configuration for power efficient SoCs. ARM also claims 75% power usage reduction in typical mobile workloads thanks to the new 16nm FinFET manufacturing processor. Expected applications include premium smartphones, larger screen mobile devices, enterprise networking, servers, wireless infrastructure, digital TV, and automotive ADAS/IVAI. The GPU is also manufactured with 16nm FinFET process. Mali-T880MP16 can be clocked up to 850 MHz, and outputs up to 1700 million triangles per second, and 13.6 gigapixels per second. That’s 1.8 times better performance than Mali-T760, and ARM also claims 40% more energy efficiency. ARM Cortex A72 processor, Mali-T880 GPU, CoreLink-C500 cache coherent interconnect, Mali-DP550 display processor unit, and Mali-V550 video processor can be combined to create SoCs support 4K video output, and decoding up to 120 fps. Ten partners have already become licensees including Rockchip, Mediatek, and HiSilicon, and products are expected in (early) 2016. 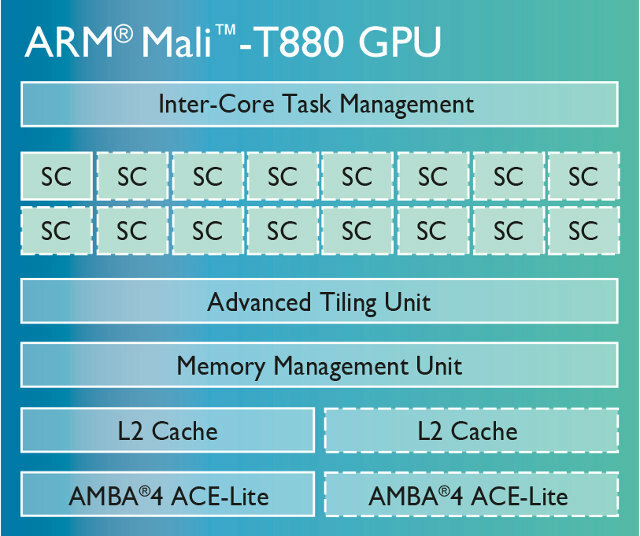 Further details may be found on ARM’s Cortex A72 and Mali-T880 product pages. Nice! 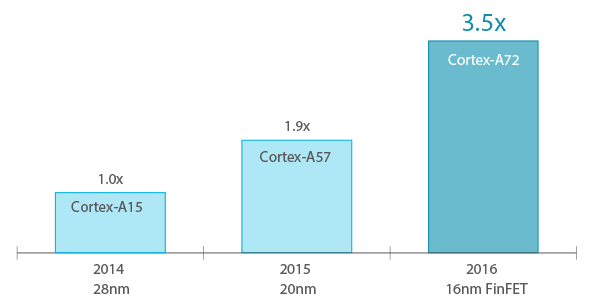 By the way, the sentence “Cortex A57 may be combined to low power Cortex A53 cores in big.LITTLE configuration for power efficient SoCs” seems a bit strange, is it supposed to talk about Cortex-A72 or Cortex-A57? Sorry my mistake, Cortex A72 of course. I’ve changed that. This is still ARMv8-A. Probably this one will be followed by ARMv8.1-A. Looks like ARM Ltd. is not planning to slow down. Finally FinFET and 14-16nm!